Today is my last day in the country, and so I popped out of the city proper and made my way to Vevey, a small Swiss town with an absolutely stunning Alpine panorama. Though it was a chilly day today and overcast, I managed to lose myself in a wander of nearly five hours. Their ‘old town’ is cobbled stone at your feet, and beautiful hanging signs above your head. 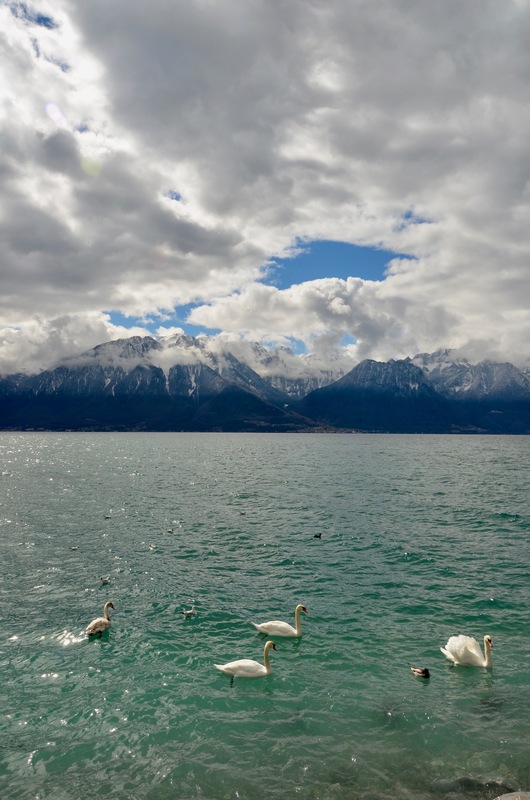 It is to here that Charlie Chaplin retired, a home in the hills overlooking Lake Geneva, and I can absolutely understand why anyone would want the peace and beauty of this region. Standing staring across the water at the mountain range, my breath did catch while I kept thinking These are the Alps. When we say Alps, this is them. The Alps. The. ALPS. Salted throughout a slight melancholy, for absolutely no good reason. On and off, I have been having trouble sleeping since France, and it’s beginning to take a toll on me. Not having a stable home, one bed, a place where I can in fact remove all items from my suitcase and hang them may be contributing to the slight imbalance which my body is forced to sort. I’ve never enjoyed living out of a suitcase and automatically hang all items in a hotel room; since I’m staying with friends and family, this is rarely possible. As of tomorrow, however, and for the rest of my time away from Ottawa, I will be able to do this, inshAllah, and I am very much looking forward to it. A warm hug across the waters to Mary. I am thinking of you and your family, and keeping your father in my prayers. You are a treasure; Edward did good, sis. 1. Having finally had fondue for lunch, because there is a rumour that the Swiss may not otherwise allow me to exit the country. Admittedly, it was a letdown. Though I am a devoted lover of all of the cheese, I am used to having something other than bread next to fondue; that I was basically sopping up near seven ounces of hot cheese with bread became quite boring quite quickly. If this is a steady diet here, I imagine fiber pills are an absolute necessity. 2. The slow roll of everyone with whom I have stayed. No one is unhinged in their need to do more see more experience more while I am visiting. Thank you for letting me set my own pace and for allowing me the room to be as excited as I am able, and as quiet as I need. 3. My Khalto (matrilineal aunt) Nuha’s reaction to when I shared my Switzerland photos with her earlier. She was over the moon and told me it felt like she was walking through the country with me. Two ‘Wow Wow!’ and how I wish she were in fact with me here. One day, inshAllah.